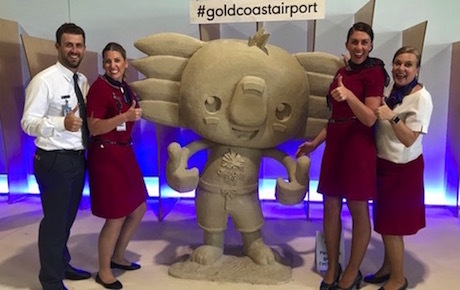 Swissport’s Gold Coast team has won one of the company’s four QHSE Global Awards for their “over and above innovative approach” to handling of the 2018 Commonwealth Games. The 2nd Annual Swissport Global QSHE Awards received 272 nominations from around the world, which were voted on by 33,715 staff members. The Quality Award for Passenger and Customer Experience recognises the team’s delivery of operations for the games, which in April saw more than 6,600 athletes and team officials from 71 countries welcomed to the Gold Coast – the first regional Australian city to host the Commonwealth Games. Swissport Senior Vice President – Pacific Rob D’Alessio congratulated the team which handles around 80 per cent of flights at the airport, saying good planning, collaboration, flexibility and a can-do attitude from management and staff were key to the success of the project. “There were no safety or security events, no significant impacts on OTP and the team was commended by the games authority, the airport and client airlines for its exceptional handling of this extraordinary event,” he said. Gold Coast Airport Chief Operating Officer Marion Charlton has previously referred to the “textbook execution” of operations during the Games. Significant planning was undertaken in the months leading up to the games with attention paid to factors such as peak event days/times; road closures affecting staff access to work; IT infrastructure; disaster recovery plans; awareness of manual handling injuries due to the large amounts of baggage and oversized items; GSE availability; and adverse weather planning. A representative from each of the winning projects/stations will be invited to visit Swissport Zürich HQ to meet the Senior Swissport leadership team, tour an airport, and see some of the beautiful Swiss countryside!